AP Panchayat Secretaries on contract basis appointment as per G.O.MS.No. 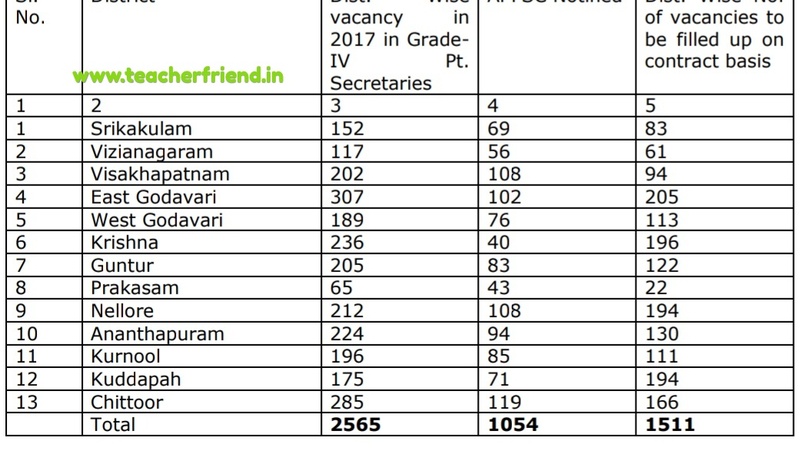 38 Dated: 27-04-2018/AP Filling up of Vacancies of Panchayat Secretaries on contract basis appointment Orders issued as per G.O.MS.No. 38 Dated: 27-04-2018/AP Panchayat Secretaries Filling of contract basis appointment Vacancy list as per G.o.No:38/AP Panchayat Secretaries Filling up of Vacancies on contract basis District wise list/Terms of Conditions for Appointment of PANCHAYAT Secretaries on contract Basis as per G.O.MS.No. 38 Dated: 27-04-2018. From the CPR&RD., Lr.No.7095/ CPR& RD/B1/2017, Dt.05.10.2017 and Dt. 24.01.2018. In pursuance of the decision taken in the review meeting held by Hon’ble Minister Panchayat Raj & Rural Development on 29.09.2017, the Commissioner, Panchayat Raj & Rural Development informed that there is need to fill up the vacancies of Panchayat Secretaries on contract basis for strengthening of the Gram Panchayats, as they are playing a vital role in bringing the developmental activities to the doorsteps of the people. Director, Panchayat Raj & Rural Development, A.P., Vijayawada to take on contract basis the services of 1511 Panchayat Secretaries (district wise vacancies specified in the Annexure-I) temporarily for a period of one year, on payment of consolidated remuneration of Rs.15,000/- per month(Rupees Fifteen thousand only) as per Rule 9 of A.P. State Subordinate Service Rules 1996, subject to the terms and conditions specified in the Annexure –II. 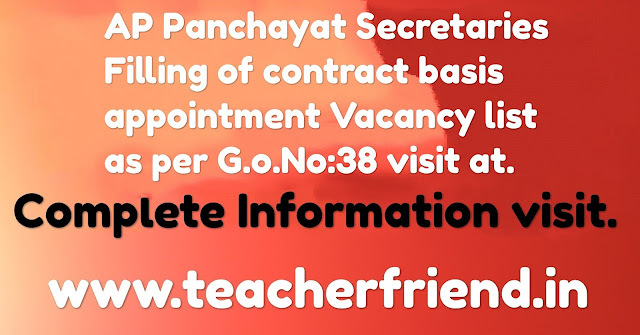 AP Contract Basis Panchayat Secretaries Filling up of Vacancies of Panchayat Secretaries on contract basis appointment vacancy list in District wise. The expenditure shall be debited to the following Head of account. 2515 - Other Rural Development Programme. 300 - Other Contractual Services. of Rule 9(a)(i)of A.P.SSS Rules,1996. reason only of such appointment to any preferential right to any other appointment in that or in any other service. contract appointment of Pts. Secretaries. The selection procedure will be 100% on merit (education qualification) instead of 80% merit + 20% interview . SC/ST/BC category is permissible in terms of G.O.Ms.No.182 GAD Dt:4-12-2017.. The contract period shall be for one year from the date of appointment. Rule of reservation will be applicable as per roster points shall be made applicable as per the Rule 22 of A.P. SSSR 1996.
the Gram Panchayat in the district and reside in the Gram Panchayat Head Quarters concerned. The Panchayat Secretary appointed on contract basis shall not have any claim or right for regularization of his/her appointment and shall not approach to any court of law with regard to regularization of contract appointment, in case the said contract is terminated midway. The candidates appointed as Panchayat Secretaries on contract basis will not have any claim or right to be appointed on regular basis and such contract appointments will be without prejudice to the regular appointments that may be made in future. service or in any other services. The selected candidate shall produce Medical Fitness Certificate issued by Government Civil Assistant Surgeon along with the original certificates to prove their age and qualification etc. mentioned points in Annexure-III. The format in which the candidate has to execute the bond is enclosed. The candidate engaged on contract basis shall execute a bond in the prescribed format as referred to at point-16 above on non-judicial stamp paper worth Rs.110/-.